Fred Kember Snr originally established the Gleneith Border Leicester Stud in 1922. However official breed Society registration was not sought until 1932(F665). The stud grew from small beginnings to around 400 ewes being put to the rams in 1944. In 1948 with the death of Fred Kember Snr. The flock slipped from registration. Fred Kember Jnr. Purchased the flock form the estate in 1950 and had the flock re-registered with the same prefix of Gleneith but with the current flock number (F1929). Fred Jnr. 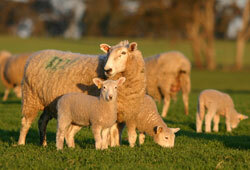 Continued breeding Border Leicesters with ewe numbers generally between 300-400. He regularly took his show team to the local shows and also showed at the Albury sheep show, which was held in the old Wool Store and them for a few years at the Albury Show Ground. In 1995 the stud incorporated all family members with Will and Wes continuing the stud tradition and with Nathan being the Fifth generation member of the Kember Family to have an active roll in Gleneith Stud.